After one of Mr. Petroni's visits, Jeff discovered a small package wrapped in crinkly green cellophane on his desk. A handwritten note was attached; its shaky inscription read: To a great doctor. Thank you for making my husband feel better. I hope you and your wife enjoy the zucchini bread. Sincerely, Mrs. Petroni. Jeff was touched that this elderly Italian woman, whom he had never met, would bake him a loaf of bread. As he toasted a slice for breakfast the following morning, he offered me one. I declined; I wasn't that hungry. Jeff ate the bread, murmuring contentedly, licking his index finger periodically to pick up the crumbs that fell on to the plate. "Sue, you gotta try this," he persisted. Reluctantly, I took a small bite. It was incredibly moist. Each slice was speckled with green zucchini shreds and studded with toasty walnuts. This bread wasn’t good. It was amazing. Our hands bumped into each other as we reached for seconds. "See, that's the problem with living in Southern California," I said, "there aren't enough little old Italian ladies making homemade bread like back home." When Jeff left for work, he had a mission: Get the recipe from Mrs. Petroni. Upon entering the house that night, I bombarded him: “Well, did you get the recipe? Was there coconut in it?" “But, why?” I whined. Mrs. Petroni was flattered that we loved the bread, "But," she said, "I don't know the recipe. I bought it from Katella’s Bakery and just wrapped it up for you." Note: The following recipe is neither from Mrs. Petroni nor from Katella's. It's my mom's. Bake it for your cardiologist or dermatologist this week. They'll appreciate it more than you know. My mom's zucchini bread is chock full of zucchini, coconut, pecans, and pineapple. It's like an old-fashioned zucchini bread married a pineapple upside-down cake. Don't be surprised if you find your family fighting over the last slice. 2. In a large bowl combine flour, salt, baking soda, baking powder, and cinnamon. 3. In a medium bowl beat eggs and sugar with an electric mixer. Add oil and vanilla, and beat until combined. Add the wet ingredients to the dry, and stir by hand. Fold in nuts, zucchini, pineapple, and coconut. 4. Divide batter evenly between two pans. Bake for 50-60 minutes, or until a cake tester inserted in the middle comes out clean. Cool for 10 minutes. Remove from pans and place on a wire rack. What a story! I do love the ingredients you have used in this especially the pineapple and coconut. A nice tropical touch. Def bookmarked and thanks for sharing Susan! Awww I wish people would bake us stuff in the pharmacy but we're not as appreciated as MD's :). Great story and a recipe to top it off. Good stuff! Too funny! I have a favorite zucchini bread recipe I make all summer, but it uses a cup of whole wheat flour which is so nice with the cinnamon. The extra addition of pineapple and coconut is completely decadent, and I'll have to try it! Okay yes - trying to figure out when in my week I can head to a market to pick up a zuke or 45 to make this recipe. It's only like 65 degrees here today - fells like fall and baking weather to me! YUM! Beautiful addition of coconut & pineapple! Your mum's recipe rules again, Susan. haha very cute story! :) believe it or not, I have never had zucchini bread (hides her face in shame). Love this, Susan! Am storing up zucchini from the CSA to make this. Definitely bake it! Funny that you were duped a bit, but it's a good story. 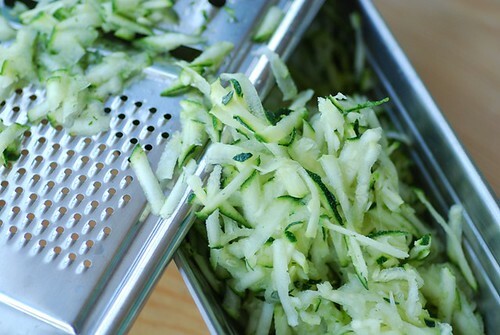 Considering how much I love zucchini, it is a bit surprising that I have never tried to make zucchini bread. Nice story and very interesting recipe: I like the idea of adding shredding coconut. How sweet that she sent a thank you bread. I do the same for my chiropractor. His office get all excited when I come in with a bag or box in my hands. 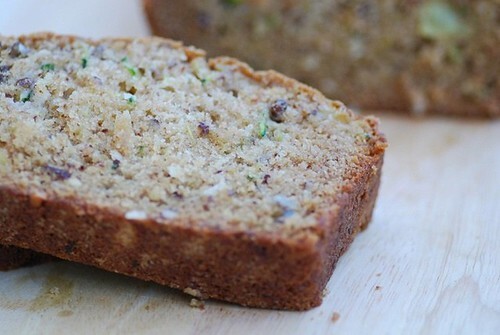 Studded with coconut this zucchini bread would be the best Susan!! I love Zucchini Bread, and I LOVE how you can adapt the same recipe to make great carrot cake/pumpkin bread/apple cake, ad infinitum. peterg-I love the tropical touch as well! cate-Eewww. Ashtray cake. At least the thought was there, right? tw-The pineapple and coconut are the most delectable ingredients. anh-I'm glad you enjoyed it! kara-Wow! Fall came quickly for you, didn't it? kalyn-But it's always fun to experiment! danielle-What?! Promise me, please, you'll make a loaf while zucchini is in season. lori-You won't be disappointed. Promise! chrystal-I'm glad you found it amusing. simona-Oh, you really should try it. It's wonderful. val-I swear. It really is the best! phoebe and cara-It really is remarkably versatile. My mom makes many different variations as well. Oh, this was a really great story, Susan. I especially love the part where you say your hands bumps while reaching for seconds. :) And of course I'm making some zucchini bread this weekend. Your recipes are always so good! What an interesting bread ... and an interesting story! :) Your bread looks absolutely yummy! Cute story :) Sounds terrific (without the nuts!!) I didn't care much for zucchini bread as a kid, but like most things, I've developed a likeness for it over the years. This post is the perfect example of why food and writing go together: I haven't been this inspired to make zucchini bread in years! P.S. I also grew up with Italians on the east coast and now live in SoCal. Miss the Italians, not the weather! Your zucchini bread looks delicious with pineapple, my husband will love it! barbara-Oh, thanks so much! You make me smile. littleteochew-I'm glad you liked them both! lori-It has that effect on people. terri-Yay! I'm so glad to hear it. I love that story! And the bread, perhaps you should send her the recipe! Cute story - I love that your husband's patient brought a treat for him! Can't wait to try the bread. Great story! I also love the addtions of coconut and pineapple- very nice unexpected twist. Will definitely try this one. Thx! LOL! So much for the little old Italian ladies baking up a storm. I'm glad you at least have a good recipe of your own. What a cute story, Susan! And your moms bread sounds so good, alittle different than my mothers, so I've bookmarked it to try! Love the addition of pinapple! Love zuke bread, but my plants did so poorly this year. Who knew I could mess up a zucchini plant??? hehe! what a great story...a little but sad but funny none the less! i made this bread and it was a hit! great post and great pics! thanks! Sounds really yummy. Ever tried it with whole wheat flour? rose-What a good idea. Unfortunately, we don't have contact info for her. hornsfan-It was sweet, wasn't it? lisa-I'm so glad you enjoyed it! Thank you. sdoc-Seriously. We couldn't believe it! lynda-The pineapple really takes it to another level. redmenace-Yeah, who knew?? I thought they were like basil-- you can't help but do well. Good luck next year, my friend! letmeeatcake-Woo-hoo! I'm so happy to hear it. Thanks for letting me know. themommychef-I have made it with half wheat and half white, but never all wheat. Only because I prefer the flavor of white. Hahaha! Loved this story. I wouldn't blame the doc for thinking it was baked by Mrs Petroni herself. There IS something about elderly (Italian) women that makes us believe every food they offer us is home-cooked/-baked/-made. I love this story! And I love zucchini bread! I always thought my mom's was the best, until I read your mom's recipe. Pineapple and coconut? Oh,my. buday-It's true. It's like I can't imagine them buying anything precooked! Susan - Thank you so much! I've been wanting to try to make zucchini bread! I decided to look here first, because your recipes are always AMAZING, and I know it will be awesome! :) Thanks so much for this wonderful blog! !